From the producers of New Zealand film Waru comes a second portmanteau film with a similar structure, but different themes. Marie took a (virtual) trip to the Pacific Islands and was touched by what she learned from Vai, screening at the Berlin Film Festival. In 2017, Kerry Warkia and Kiel McNaughton produced Waru, a powerful portmanteau film in which eight different female Māori directors were tasked with creating a 10-minute short film featuring female characters, each of which has a connection to the funeral of a young boy. Together, they resulted in an excoriating view of New Zealand’s failure to address issues of child abuse, and also highlighted racism and inequality. 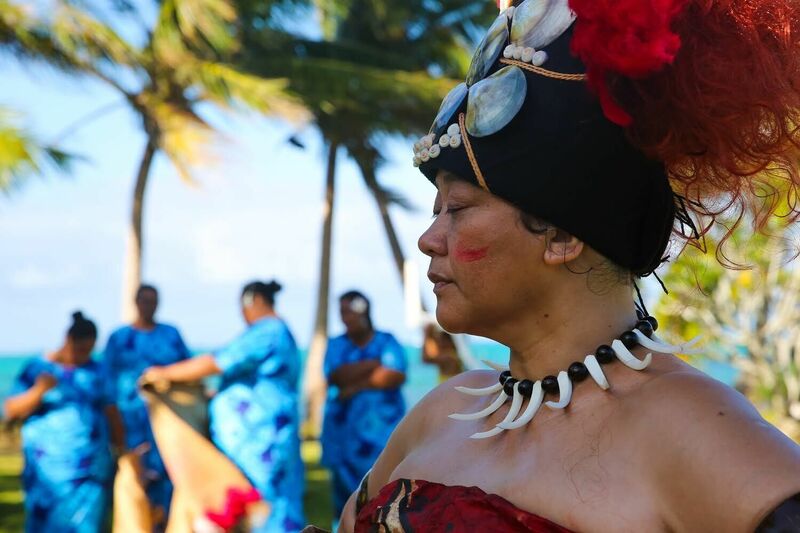 Following the success of Waru, the same producers invited nine female filmmakers to develop stories of female empowerment through the cultures of the Pacific Islands to which they are personally connected, and Vai is the outcome. Each film created is 10 minutes long, constructed in one continuous take, and features a lead character named Vai together with a theme of female empowerment through the culture of the Pacific Island to which they belong. In each of the languages used in the various segments, Vai means water, and the importance of the substance in everyday life is also not overlooked in any setting. In fact, the one section which is set completely indoors, and where water is not seen, is the most claustrophobic of them all. Spanning the breadth of the Pacific Ocean, we meet Vai in various guises; from a 7-year-old Fijian girl, through a 42 year-old Samoan woman to an 80 year-old Māori elder, visiting counterparts in Tonga, Solomon Islands, Cook Islands and Niue along the way. Despite the differing ages of the woman, there are threads in common, embedded in their Pacific Island roots. Vai shares a theme of separated families, with parents, or young adults, leaving their island homes to try to secure a better economic future for the rest of the family. It seems that no matter which island they call home, the only hope of economic advancement is to move to New Zealand. Except that when we meet the iteration of Vai who has done just that, it becomes immediately obvious that the stresses of being breadwinner, carer and successful student are too much to bear all at once, and she is in danger of losing everything. It’s a tough section to watch as no-one, not even her fellow islander, seems to appreciate her circumstances. It’s also, perhaps, the most heavy-handed (message-wise at least) of all the segments, as student Vai cracks and angrily explains everything to her unsuspecting tutor. By complete contrast my favourite section was one which explained very little, but which touched on a very emotional level through the performance of Fiona Collins as Vai who, at the age of 42, has returned to the island to take part in a cultural ceremony but fears she lacks the proper connection, having been absent for several years. Saying little, everything she feels plays across her face as she makes her way along the seafront followed by friends and family. It’s a strong and beautiful few moments as she finds her feet. There’s no doubt that Pacific Island women are under pressure – and yet what perhaps makes Vai so accessible, despite its sometimes exotic setting, is that women all over the world feel the same. Dreams are shattered, children need to be cared for, trying to be all things to all people is a burden.